Chivasso (Italy): installation of automatic public toilet TMAX in open-air market area. 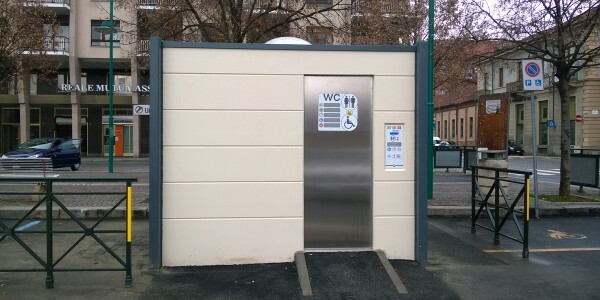 In piazza d’Armi there was already a PTMatic self-cleaning toilet. The Chivasso municipality, inside a global renovation project of city public services, asked to replace the old toilet with a last generation one. 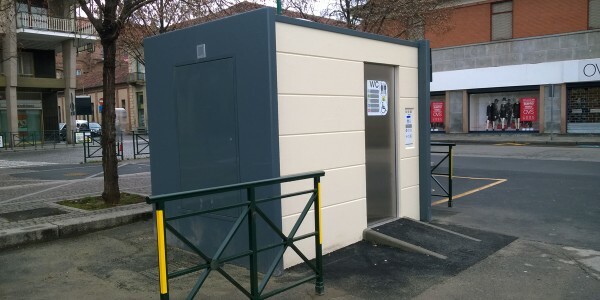 We installed an automatic public toilet TMAX, characterized by high levels of safety and hygiene and minimalist exterior design, appropriate to sourronding urban context. TMAX is an AUTOMATIZED and SELF-CLEANING toilet for OUTDOOR installation, projected and built in a unique blend of design and technology. The facility guarantees safety to users and a perfect sanitation and drying after each use. This model meets all the highest aesthetic and functional expectations of modern cities: the synergy between the high resistance of its components and the flexibility of external finishes allow a perfect integration into every urban setting. 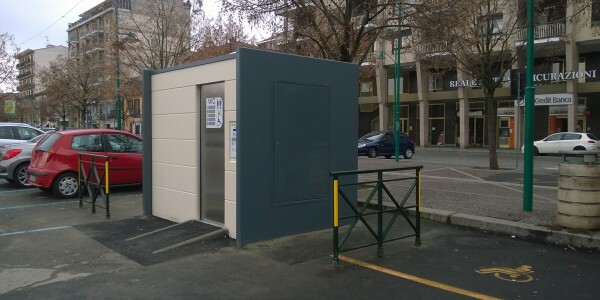 The unit is equipped with an automatic opening and closing sliding door, washbasin with automatic dispensers of water, soap and hot air, vandal resistant litterbin, mirror, grab bars for disabled persons and a remote control system for an efficient and immediate management. Scouring of floors with shifting system for mechanized removal of debris; washing, disinfection and drying of floors with Lava–Tergipavimento® technology, patent nr. MI 2005 A001873.